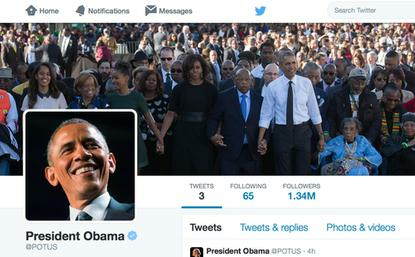 U.S. President Barack Obama is on Twitter for real. The @POTUS account is verified, and unlike @BarackObama which is mostly run by staffers, it will feature tweets by the man himself. The first tweet on the account, sent Monday morning, reads "Hello, Twitter! It's Barack. Really! Six years in, they're finally giving me my own account." Now, what's the protocol for turning over control of the Twitter account to your successor on Inauguration Day? Bill Clinton wanted to know, and Obama tweeted back reassuringly, "The handle comes with the house." YouTube Kids is already under fire after a coalition of groups asked the Federal Trade Commission to investigate the app for loading children up with the kind of content that would be illegal to broadcast to that audience. Now those groups have added ammunition to their complaint, sending the regulator a video compilation of content on the service that's inappropriate for kids, such as ads for alcohol. The advocates also found "a curse-filled mashup of the 1995 film "Casino" and a Sesame Street segment featuring Bert and Ernie," the Washington Post reports. Turns out Samsung won't have to pony up all $930 million in damages that Apple was awarded in 2012, a U.S. appeals court ruled Monday. While the court agreed with a California jury that Samsung violated Apple design and utility patents related to the iPhone, it disagreed that Samsung infringed on Apple's trade dress, or the look and packaging of the iPhone. That sends the case back to San Jose where the U.S. District Court has to recalculate damages. Apple, Google and security experts are sending a letter to Obama Tuesday to ask him to oppose any move to mess with security on mobile devices to provide law enforcement with backdoors to encrypted data, the Washington Post reports. Any such access can be exploited not only by police but also by bad actors, the argument runs. The Post said that the letter is signed by three of the five members of a group Obama appointed in 2013 to review technology policies after former NSA contractor Edward Snowden exposed widespread government surveillance. Contrary to the suggestion that most people today accept they will have little privacy online, a new survey shows that most U.S. residents have major problems with government surveillance, and six in 10 want to see the records collection provisions of the Patriot Act modified. The research was conducted by the American Civil Liberties Union, and found that support for amending that legislation cut across party lines and age groups. Another 82 percent of the 1,001 likely voters in the survey said they were concerned that the U.S. government is collecting "personal information" like phone records, emails and bank statements. Sony is setting up a video game development studio focused on Project Morpheus, its PlayStation 4 virtual reality headset. The studio will be located in the northwest of England, and the company's intention is to build a small dedicated team to showcase the new immersive technology. The Morpheus headset is supposed to be released in the first half of next year. With backers like Qualcomm, Cisco Systems and a former ARM executive, startup 21 has a new take on both bitcoin mining and the chip business. It's designed an embedded chip for bitcoin mining, called BitShare, that it wants to get embedded into millions of smartphones and tablets, so those devices will work collectively to mine new units of the cryptocurrency. The price wars in cloud computing continue: on Monday, Google said it would cut its prices on its Cloud Platform, claiming in a blog post that it now beat competitors' prices by 40 percent. Depending on configuration, customers can spend from 5 percent less for high CPU instances to 30 percent less for micro instances; standard instances are now 20 percent cheaper than before. For years Apple has been rumored to be getting ready to disrupt the TV market as it did smartphones, but now the Wall Street Journal reports that it has dropped the project and moved the people involved on to other tasks over a year ago. It developed some innovative technology along the way, but without a category killer to bring to market apparently decided that it wasn't worth going up against the incumbents in the space. There's more than one wacky way to get around at Maker Faire -- IDG News found many creative contraptions on the move last weekend. The New Yorker went inside the independent studio developing a game unlike any you've seen before: No Man's Sky.